Pro Seal 896 is a premium grade, water based acrylic sealer which uses nano technology to deliver exceptional protection for concrete, exposed aggregate, natural stone, and other paved surfaces. Water Based Sealers’ ‘Trade Secret’ formula uses acrylic co-polymers to create a cross linking, tough, yet flexible clear sealer that provides a streak free finish that is hot tyre mark resistant, and resistant to motor oil, grease, and most chemicals. Pro Seal 896 is the only commercial grade vehicle traffic sealer that is applied to a wet surface. Click here for more information on Pro Seal 896. 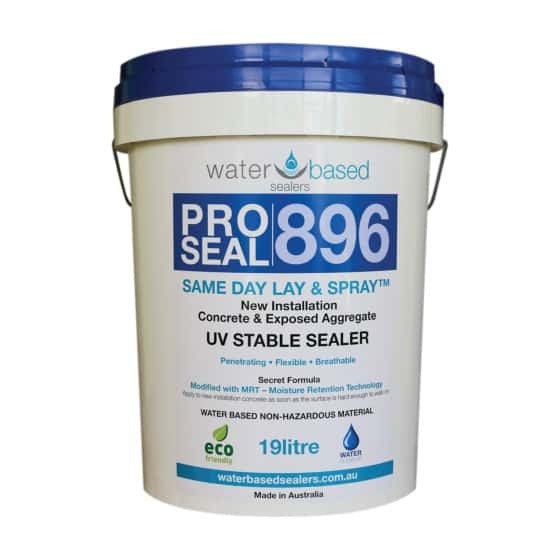 Pro Seal 896 is a water based acrylic sealer. 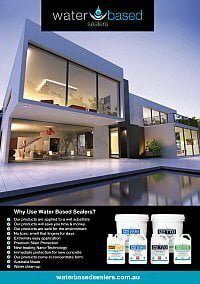 It was designed by Water Based Sealers in Australia for use in our harsh Australian conditions. 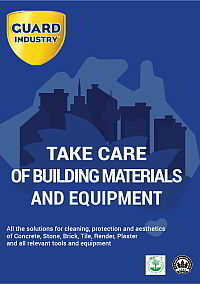 This amazing concrete sealer is an eco friendly, non-toxic, UV-stable, breathable and penetrating concrete sealer. 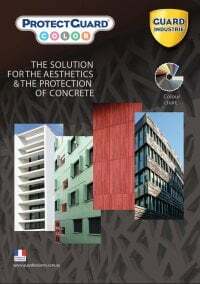 It is suitable for use on most porous external surfaces. Pro Seal will not darken the look of the surface but will add some shine, particularly to smooth surfaces. When used on exposed aggregate it will make the stones shine without significantly altering the mortar. This will enhance the contrast between the two and make the aggregate sparkle. Pro Seal 770 can be used as a first coat to provide some subtle colour enhancement if desired. Acrylic sealer can be either water based or solvent based. Most types of acrylic sealer are film forming. They produce a thick film with quite weak surface adhesion. Solvent based ones are usually harder wearing but are more brittle and are not breathable. Any expansion and contraction can cause crazing. Any water trapped below the sealer can cause the seal to delaminate and peel off. Most water based ones are breathable, but are soft and flexible and as such aren’t very abrasion resistant. It contains a unique, specially designed, acrylic co-polymer. Once cured this ProSeal will not re-emulsify in water or most other solvents and common chemicals. This guarantees increased strength, durability and chemical resistance. It is a true nano sealer that penetrates deep into porous surfaces, using water as a conduit, for the ultimate in adhesion. As the Pro Seal dries, the polymer chains cross-link together to form a matrix seal. This matrix locks together everything in the top layers of the surface. This provides outstanding strength, stain resistance and durability. The top of this matrix forms a tough film on the surface that acts as a wear layer. It is breathable. Moisture can pass through the sealer as vapour. 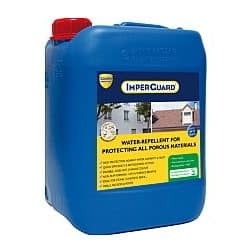 This enables any water that gets into the substrate to escape without damaging the sealer or the material being sealed. Water can get into the substrate through control joints, sealer failures and through rising damp. Sealers that can’t breathe will delaminate from the surface as the water vapour tries to escape. Therefore, a breathable sealer is a must in all outdoor applications. It can be applied in almost all weather conditions. Solvent acrylic sealer requires the substrate to contain less than 5% moisture and for the surface temperature to be between 5 and 30 degrees Celsius. Pro Seal loves water and is not negatively affected by hot or cold temperatures so you can seal all year round. The only time you can’t seal is while it is raining, simply because the rain will wash away the uncured sealer. Since Pro Seal 896 is applied to a wet surface, it can be used straight after pressure cleaning. Or applied to new concrete as soon as it’s hard enough to walk on. 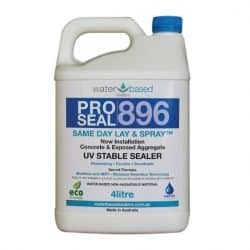 So, Pro Seal 896 provides the earliest possible stain protection. Why wait for surfaces to dry when you can seal straight away? Applying Pro Seal 896 on the day of a pour significantly increases the hardness and durability of the concrete itself by improving curing. Further it adds stain resistance before any spills can occur. Apply immediately after power troweling for a super strong and durable floor finish. 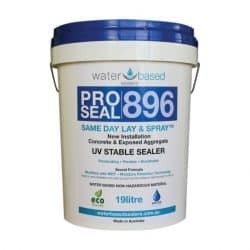 Pro Seal 896 will not turn white in wet conditions, will not yellow, and will never flake or peel. 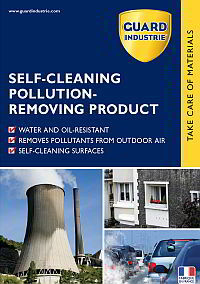 This product is safe to use and is much better for the environment that solvent based alternatives. It has low VOC’s and is safe to use around children and pets. 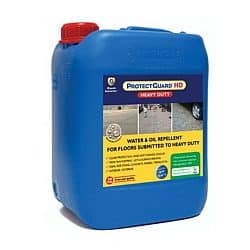 Pro Seal 896 concrete sealer is supplied as a concentrate which is diluted with water prior to use. 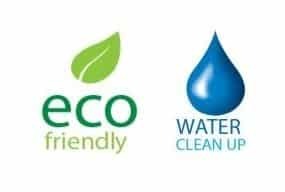 This reduces shipping costs and thereby further reduces environmental impact and product cost. 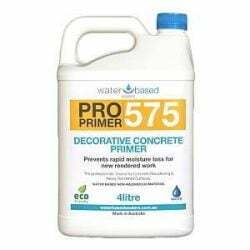 Pro-Seal 896 can be used with confidence to seal and provide stain protection for new & old concrete, exposed aggregate, liquid limestone, clay & concrete pavers, and all types of natural stone. 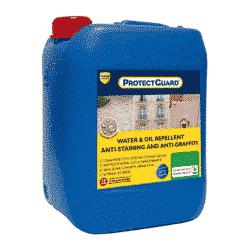 Pro Seal 896 comes in a highly concentrated form that requires dilution with water prior to application. 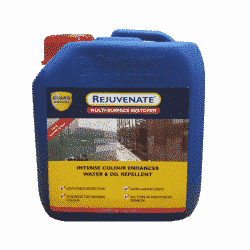 Completely saturate old and dry substrates prior to application to ensure the best possible penetration and performance. Diluted product should be applied at a rate of 3 – 5 m2 per litre depending on surface porosity. 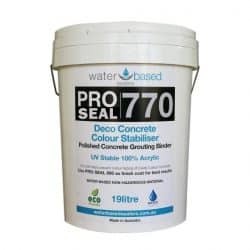 For highly porous substrates consider pre-treatment with Pro-Polish 770. Use a soft bristle broom to sweep out any pools that develop. The sealer can be walked over without concern during the curing process. In many instances a single flood coat is all that is required. If required, a second mist coat can be applied as soon as the first coat is touch dry. Doesn’t need to be stripped off prior to reapplication. While Pro-Seal 896 will remain in the substrate and provide protection for 15+ years it is recommended that a re-coat be applied to the surface once every 3 years to maintain best surface appearance. This is particularly relevant in high traffic areas. Wash up any spills by ﬂushing with water. It is best practice to clean spills as soon as practical. Most household cleaners can be used on Pro-Seal 896, however use of harsh chemicals may damage or reduce the working life of the sealer. The product is great, saves on application time being able to pressure clean and seal in one day without the hassle of worrying about moisture. Great product, wouldn’t use anything else. James has the knowledge when it comes to sealers to back it up. I used Proseal 896 to seal over 200 sqm around my house. 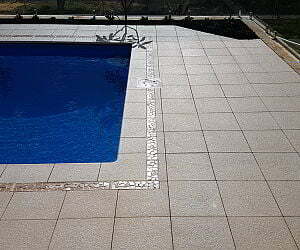 The application was a breeze – I will NEVER pay to have my pavers, pool surrounds etc sealed again. James was happy to answer any queries I had. Save yourself the hassle and time (getting quotes, waiting for tradies, etc) and do it yourself – so easy! High performance, cost effective and time saving sealer. We never have any callbacks when using this product and we can clean and seal in one day without any stress. Awesome product!